Perhaps you thought being addicted to coffee was something new. You would be mistaken. Apparently in Bach's day it was limited to females. Or perhaps it's the usual men get to do whatever they want while women have to be controlled. 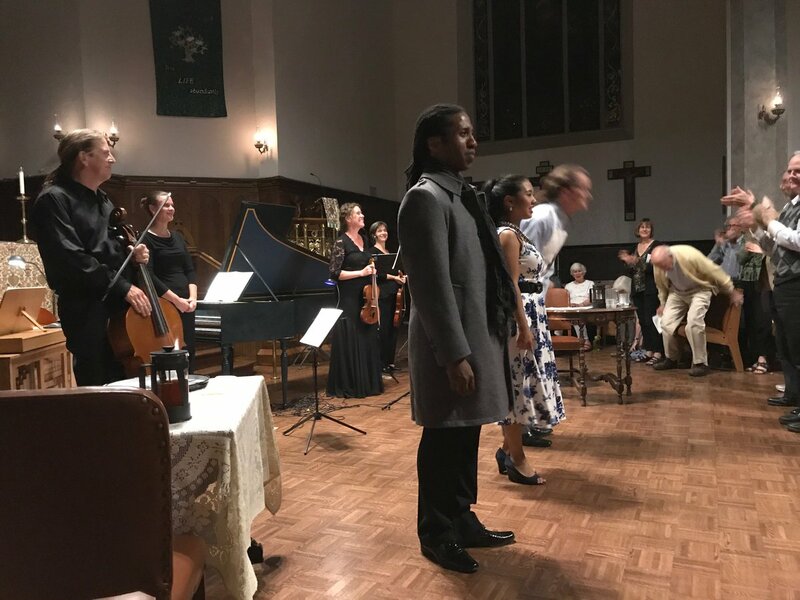 Sacramento Baroque Soloists presented a semi-staged version of Johann Sebastian Bach's Coffee Cantata with three soloists: Derek Keller as the narrator, Omari Tau as papa Schlendarian and Bernadette Mondok as his daughter Lischen. This was charming and amusing. Coffee was provided. Sacramento Baroque Soloists are a new group for me, though I think they have been around Sacramento for a while. The program was filled out with a concerto by Georg Philipp Telemann and Cantata BWV 54 by Bach. Derek Keller was the soloist in the Bach Cantata where he billed himself as a countertenor, and later in the Coffee Cantata he was a tenor. I didn't hear falsetto from him. For me he sounded more like a haute contra, a French style of high tenor. He sounded fine, just not like a countertenor.